LP0125. 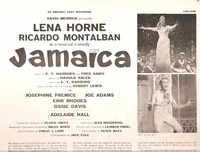 JAMAICA, Original 1957 Broadway Cast, w.Lena Horne, Ricardo Montalban, Ossie Davis, Josephine Premice, Joe Adams, Erik Rhodes, Adelaide Hall. [The musical opened on Broadway at the Imperial Theatre on October 31, 1957 and closed on April 11, 1959 after 558 performances.] Shaded Dog black RCA LOC-1036.